We're approaching an interesting time in PC graphics. On the one hand, Nvidia, AMD and Intel are all busy designing architectures that will power the GPUs of tomorrow. Connected to the desktop computer via a discrete PCIe card or integrated into gaming laptops, the fundamental design remains the same as five years' ago. The interesting part is the wrinkle that cloud-based rendering may have on future buying choices. Google's Stadia promises low-latency game streaming at 4K60 HDR, while Microsoft isn't far behind with its cloud-streamed approach currently known as Project xCloud. GPUs are here to stay; it is the method of pixel delivery that may change. 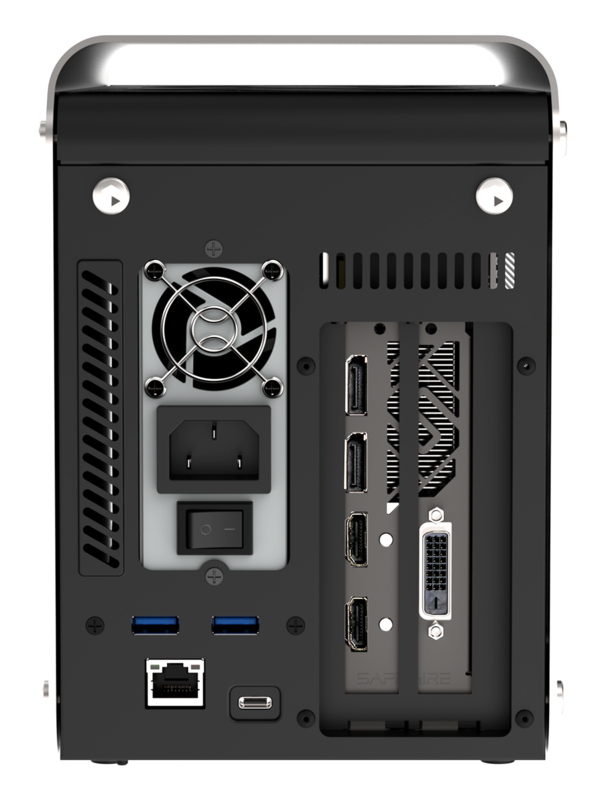 Bridging this gap between add-in card and cloud computing are external GPU boxes that connect via high-speed Thunderbolt 3 riding over USB-C. Plugged into any computer toting such a port, they promise to turbocharge gaming performance, bringing it up towards full-on desktop levels. Perfect, you might say, for Ultrabooks, MacBooks, and NUC-style PCs. Who needs cloud rendering when you can readily access a high-end card's potential via a single cable? 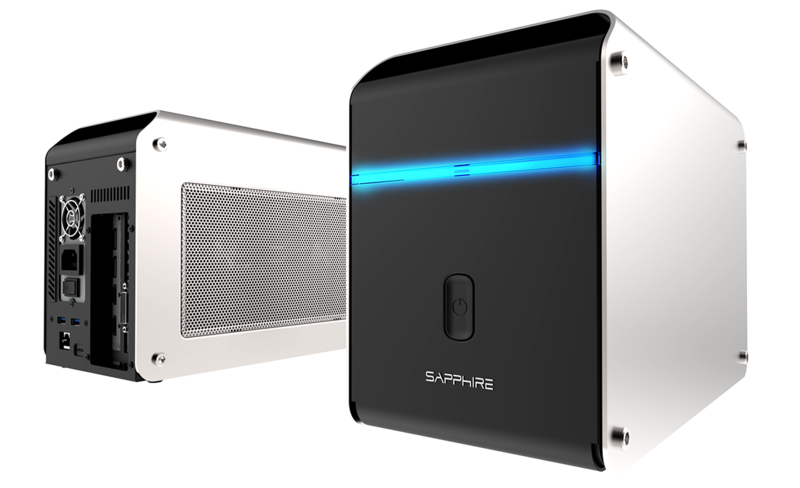 External GPU boxes have been done before, many times, so Sapphire isn't reinventing the wheel with its enclosure dubbed GearBox. Rather, pleasing aesthetics, value for money, and ease of use are the main selling points. And it's a looker. 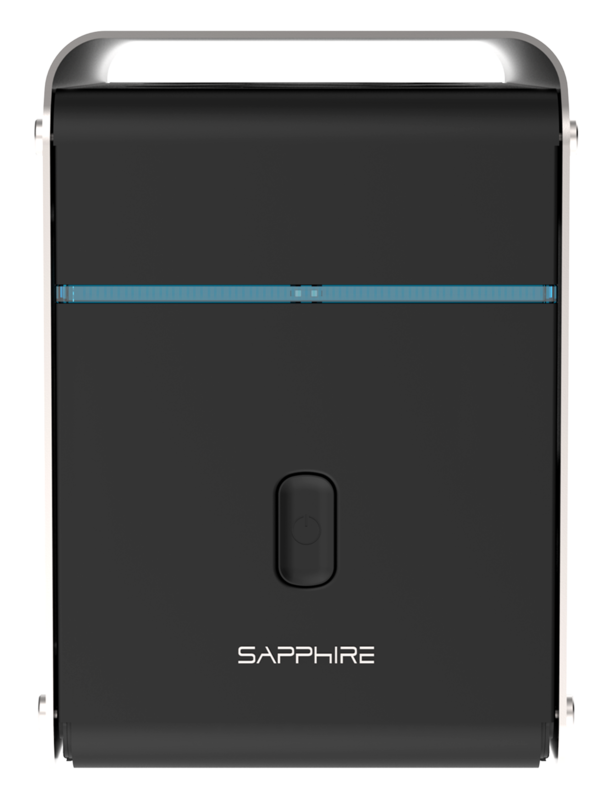 Measuring 300mm (l) x 138mm (w) x 204mm (h), Sapphire uses a single piece of anodised aluminium to surround the metal chassis. The colour-matching mesh on the GPU side offers a modicum of ventilation as well as an opaque view of the installed card. The solitary button switches the unit on/off and activates the strip of horizontal lighting across the front. 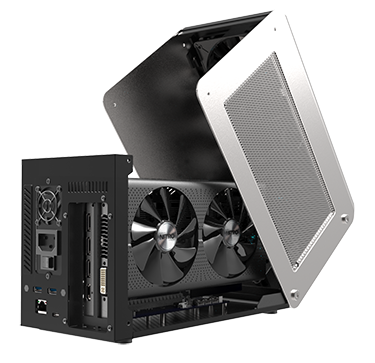 Given the weight of the unit, which spirals to over 3kg with a decent graphics card in situ, the aluminium cover sensibly doubles duties as a carry handle - the intervening space between chassis and cover is just large enough to get your fingers into - and it's useful as a breathing space for the twin cooling fans located inside. Connectivity resides around back. The smallest connector, USB-C, is the most important, as it ferries the 40Gbps bandwidth - four lanes of PCIe Gen3, eight lanes of DisplayPort 1.2 - meaning it's good for quickly shifting the contents of the framebuffer. There's 100W of charging capability, too, handy for reinvigorating an Ultrabook without the need for its own dedicated charger. 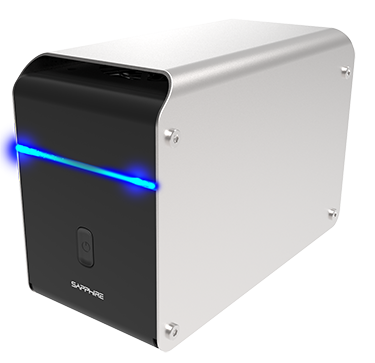 Extending the usefulness, GearBox includes a Gigabit Ethernet port and dual USB 3.0. That's fine for a keyboard and mouse, to turn your Ultrabook or MacBook into a fully-fledged desktop, though we note rivals such as Razer offer four ports and a second Thunderbolt controller for GPU priority. Sold as barebones units, these boxes are used in one of two ways. Firstly, the add-in graphics can be run on the host computer's own screen via the USB-C cable. Secondly, for those wanting gaming thrills and spills on a bigger canvas, the installed graphics card outputs to a standalone monitor via its own selection of I/O ports. Getting inside is as easy as removing eight Allen screws via a supplied key. Up pops the cover, while removing a further two from the rear clears the fans to enable unfettered access to the interior. What's left is the GearBox's barebones comprising an Enhance ENH-2350 500W PSU plumbed out with dual 8-pin connectors for the graphics card and the usual 24-pin and 8-pin EPS for the motherboard. Incidentally, it is the same unit as present in the Razer Core v2. All told, there are four fans in the unit - dual 120mm Sapphire-branded spinners that are most likely used on its range of premium graphics cards, as well as a couple of 40mm fans present in the Enhance supply. None switch off at low loads, resulting in a steady hum when the GearBox is idling, rising to a noticeable thrum when gaming - more on that later. That horizontal lighting strip is piercingly bright, overly so in our opinion, which is made worse by the fact that it can't be manually turned off. 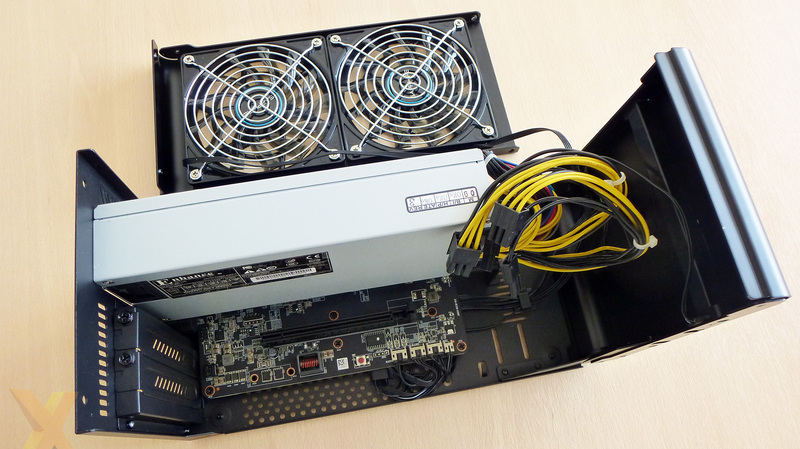 Installation of a Sapphire Radeon RX 580 Nitro+ is a cinch, and you can expect to have a fully-operational box within five minutes of popping the cover. Bear in mind you cannot just throw any graphics card you like into the GearBox. Internal limits of 266mm (l) and 125mm (h) preclude premium GPUs outfitted with monster coolers - Radeon VII, we're looking at you - or triple-slot designs, while a 300W ceiling TDP is sensible. 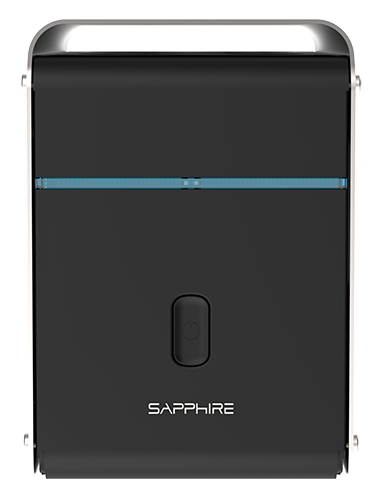 Sapphire is aligned with AMD, of course, yet there's no reason why GeForces cannot be used in the GearBox. In fact, one of the best gaming cards around, GeForce RTX 2080 Ti Founders Edition, just fits. Happy days, if your wallet is deep enough. Speaking of money, the GearBox costs £275 on its own, and that naturally excludes the financial outlay of the graphics card itself. Going for even a reasonable card such as a Radeon RX 580 pushes the cost to about £475, depending upon model, but that is the nature of external boxes; you can't find other decent ones much below £300. 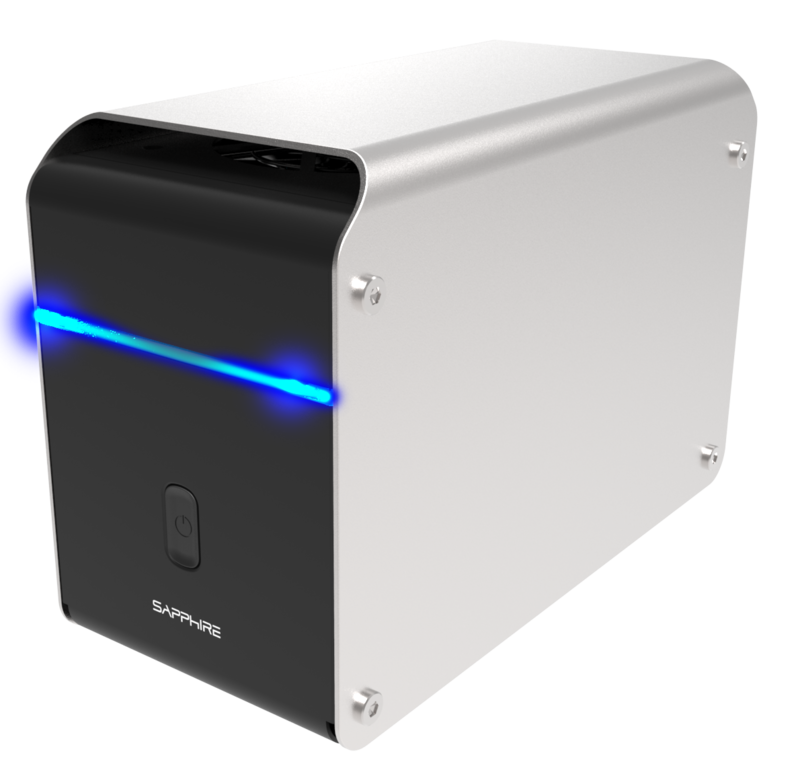 Sapphire provided a fully-built Intel NUC715BNH for evaluation purposes, whose Core i5-7260U processor amalgamates Iris Plus Graphics 640. 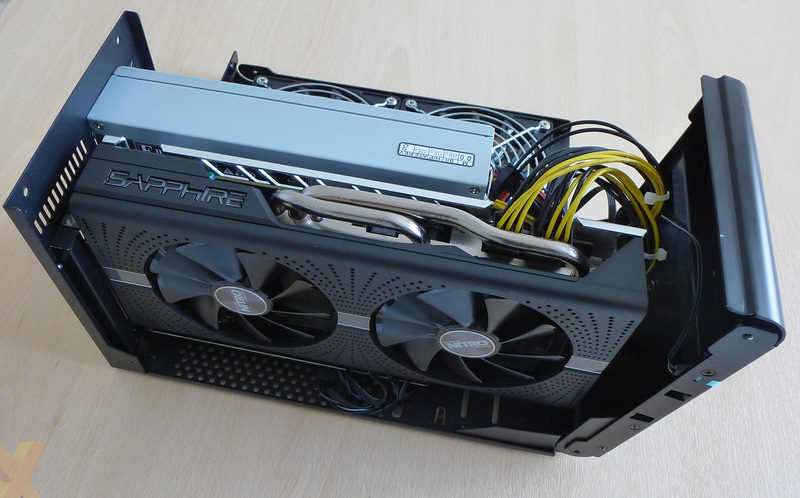 Based on the high-end GT3e GPU comprising 48 execution units and 64MB of supporting cache, its peak performance is actually rather anaemic, as we will demonstrate later on in the review. In fact, one could say, they're in dire need of a graphics boost, a la GearBox. 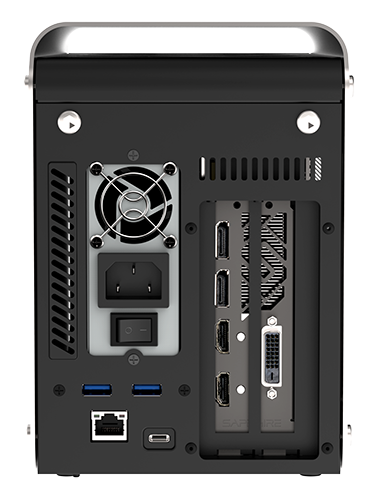 Getting the external box up and running on the NUC is as simple as connecting the USB-C cable - which is rather short at 20cm - between devices, outputting an also-supplied Sapphire Radeon RX 580 Nitro+ to an external monitor via DisplayPort, and switching on. 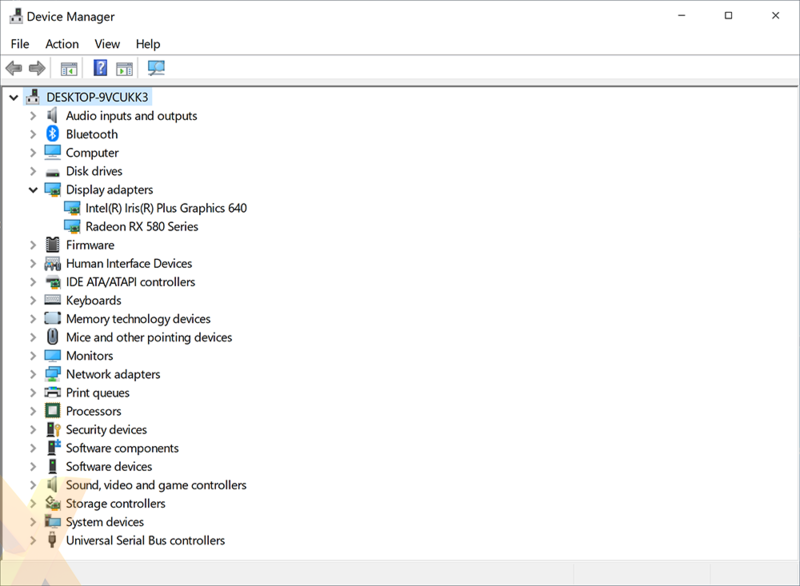 Windows Update takes care of the connection software, while we manually installed the latest Adrenaline 19.3.3 drivers. 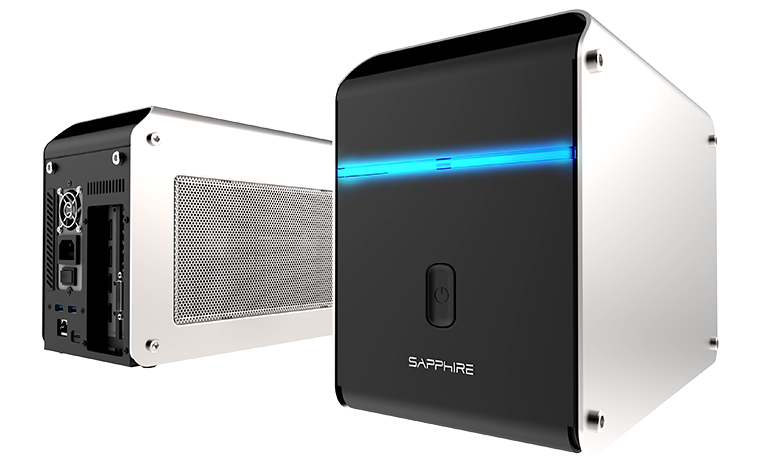 Two questions present themselves when judging the merit of an external enclosure like the Sapphire GearBox. First, how much better is performance than the integrated graphics available on Ultrabook or NUC-style PCs? 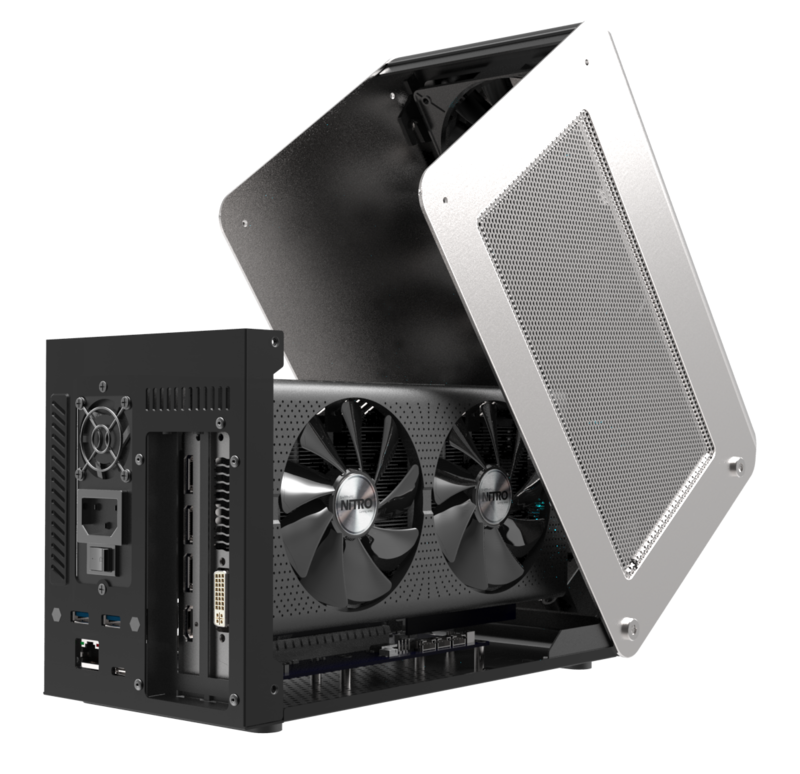 Secondly, though of lesser importance, how close does the GearBox and specific graphics card get to having it installed in a proper gaming PC instead? Let's get to answering both.